When my wife and I started traveling to the Caribbean over 10 years ago, we agreed not to visit the same place twice — to see as many islands and resorts as possible. 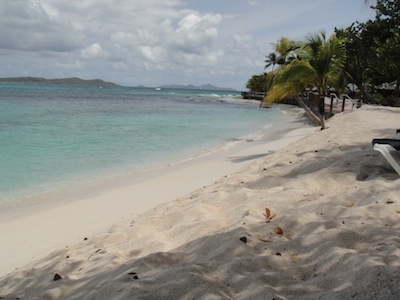 Palm Island Resort in the Grenadines made us break that rule. We just returned from our second visit, and it won’t be our last. Palm Island is not for everybody. If you need flat-screen TVs and shopping and constant entertainment, this is probably not for you. But for us, and many like us, this is a little slice of Caribbean paradise. We spent most of our days on the beach, reading, taking a dip, or just walking and enjoying the sun. It’s peace and quiet. It’s relaxing and reconnecting with your spouse. While the beach is the star attraction, Palm Island has lots of activities such as snorkeling trips to the Tobago Cays or a day trip to St. Vincent for an island tour. We opted to stay on island this trip but we did have a picnic lunch delivered to us (at a secluded beach away from the main resort area) with real china, real silverware, real napkins, and real flutes for our champagne — great food and great service. As for resort amenities, the small gym met my needs perfectly. My wife had a massage at the spa and raved about it. There’s also a pool and a tennis court, a library and computer for guest use, and Wi-Fi is available in the reception area. I recommend Palm Island’s beachfront cottages but the Palm View Rooms are also a good option, and for a slightly higher level of luxury, try the Island Lofts. Each room has an air conditioner, but ceiling fans are usually all you need. Two beach loungers come with each room, so if you don’t want to walk down to the main beach you can enjoy the sun right outside your door. There’s also a table and chairs with an umbrella — great for watching the sun set or for sipping your first cup of coffee in the morning. Palm Island gets five stars for food. Breakfast includes fresh local fruit, while lunch options include great burgers and salads. Amazing dinners run the gamut from medallions of pork to pan-seared dorado, and Chef Baka uses local sources frequently, especially for herbs and veggies. Two nights a week there’s a buffet: beach barbecue on Wednesday and Caribbean night on Saturday, when a rum tasting is included. (Sparrow’s is the best, and it’s from St. Vincent!) However, we needed gluten-free options and Chef delivered. Gluten-free and vegetarian options are clearly noted on each evening’s dinner menu, but Chef made a special loaf of gluten-free bread so my wife could have toast with her breakfast every day. Nice touch. On Sunday, Chef gave a cooking demonstration using traditional Caribbean methods, and even gave us his recipe. The staff at Palm Island is fantastic. Everybody is friendly, helpful, genuinely eager to please. We both got slight sunburns the first day (yes, we applied sunscreen, just not effectively enough). My wife looked in the gift shop for some zinc oxide for her nose, but they didn’t have any. So a staff member arranged for slices of aloe vera to be delivered to our room. Even better. No, Palm Island is not for everybody. Getting there is an adventure in itself, and some might find the resort a bit laid-back. But we go to the Caribbean specifically to be laid-back for a week — maybe longer next time? 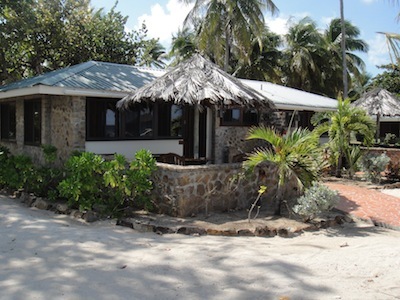 For reservations, visit www.palmislandresortgrenadines.com, or call toll-free 866-237-2157. Plan on flying to Barbados. There you will be met by a Palm Island representative who will guide you to your SVG Air flight to Union Island. Book seven nights or more and Palm Island covers this leg of your journey. Plan to arrive on Barbados by early afternoon, though. Flights to Union Island must arrive there before dark — there are no runway lights! When you arrive on Union Island, you will again be met by a Palm Island representative who will take you by golf cart to the Palm Island boat for a short ride to the resort. At the Palm Island dock, staff members will greet you with a drink and show you to your room.